One of the best things about the UnTextbook for Myth-Folklore is that it is incredibly easy to update the page since they are just Blogger blog posts. In my old website, I couldn't easily update the pages, but now it is completely easy, which means it is really worth gathering feedback, large and small. BRIEF DESCRIPTION. 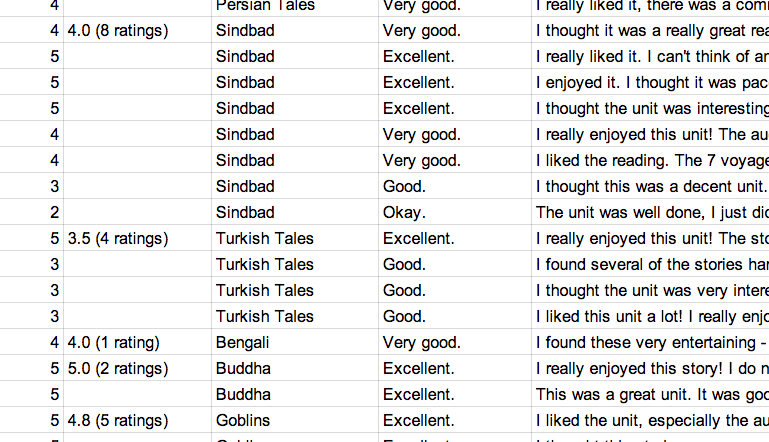 Each week, I ask the students to fill out a Google Form which solicits ratings and open-ended feedback on the reading unit they chose for the week. I then tote up the results each week and share them with the students via the Announcements blog as UnTextbook Weekly Reports. DETAILS. The data goes into a spreadsheet which is easy to manipulate. I standardize the unit titles, assign the week labels, and then calculate the averages. It just takes a few minutes to do that. I then grab the open-ended comments from the students and use those to write up my weekly replies. Some of the comments are about issues I can take care of quickly, while others are long-term development issues. In addition to the Google Form, I am also getting more feedback when students choose to do a blog post where they provide more detail about their reading experience. If you read through the weekly essay blog posts, you can see that quite a few students are choosing to write about the reading units, which is just great. They have a wide range of topics to choose from, and I think the large numbers of students choosing to write about the reading units is a good sign! Since they have a wider range of choices than before, it makes sense that they would be more committed to their choice and have more to say about it. HISTORY. 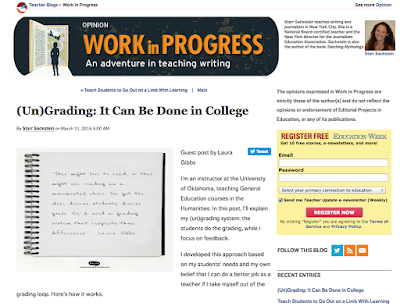 In the past, I had an anecdotal sense of what the students liked and did not like about the course readings at my old webiste, but because the website was so hard to update, I was not able to make good use of that anecdotal feedback. Now that I have a very flexible system that is easy to update, I knew I wanted to get data every week from the students about their reading experience. Revise the Content. By gathering feedback from the students, I can keep revising the content to make it more useful. Target New Content. As I learn more about what the students are enjoying I can make better choices about new content. Promote Self-Awareness. By asking the students about their choices and about their reading experience, I hope to promote more self-awareness as they make choices and do the reading in future weeks. Picture the Community. By sharing information about the choices people are making and their rating of the readings, I hope to create a sense of community experience in addition to each student's individual experience. I am thrilled with how well the Google Form is working. I would also really like to get students to leave comments on the reading pages, too, asking specific questions about specific stories. I'm not really sure how to do that. I've mentioned it in various places, and they are used to the idea of leaving blog comments from other activities in the class, but they are clearly not used to the idea of leaving comments and questions on the class reading. I may need to just go ahead and require that they do that, although I am reluctant to make it an actual requirement. So I'm pondering on that. The more feedback, the better!